How good is Thailand’s best whiskey – Hong Thong? You don’t have much choice when it comes to Thai whiskey. While Sang Som and Mekhong are quite popular brown liquors they are not quite whiskeys but rather rums: The primary ingredient of these two brands is molasses which makes them spiced rum. 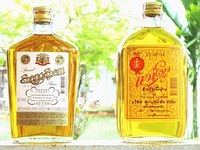 On the label of Sang Som it even says “Thai Rum” and it’s still being sold as “Thai Whiskey” in bars and clubs all over Thailand. Weird. I guess just because it sounds better. Whiskey is a product of distilling alcohol made from grains and that is exactly what Hong Thong and Blend 285 are (even if it still contains some molasses), Thailand’s most popular whiskeys and like most other brands being produced by Thailand’s largest beverage companies, ThaiBev. Of course there are a few other smaller brands (100 Pipers, Lao Khao) but Hong Thong and Blend 285 are definitely what Thai locals drink most and you notice that by just walking along the side Sois and you can see Thai guys mostly drinking Leo beer or Hong Thong / Blend whiskey. Maybe it’s also because they’re slightly cheaper than Sang Som. 350ml bottle for around 110 baht for Hong Thong compared to 140 baht for the same Sang Som bottle. But then Sang Som is a bit stronger (40%) compared to Hong Thong and Blend 285 (both 35%). I tried both Hong Thong and Sang Som drinking pure or just with some ice but it just doesn’t taste any good. After all you buy that kind of liquor because it’s cheap and if you mix it with ice and soda (how Thai people prefer it) than it’s pretty drinkable. What I like about Hong Thong is that even if I drink one of these small 350ml bottles all by myself I’m not just getting drunk very cheap but somehow I never get a hangover the next day – very different with Sang Som or Mekhong. Maybe that’s the main secret of Hong Thong or they add some special kind of rice so Thai guys like to drink it every other night. 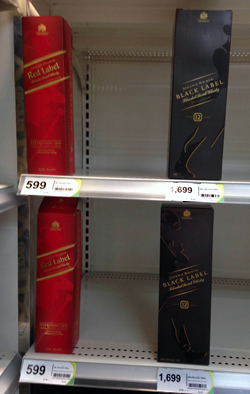 You can find several imported whiskeys in Thailand and by far the most popular and consumed one is Johnnie Walker Whiskey, Thai people usually drink red label which costs about 600 Baht in the supermarket or if they can afford it Black Label for 1,700 Baht. Of course you can also find Gold Label, Blue Label etc. but these ones are rarely consumed and I don’t think many Thais would taste the difference. The people rather buy the more important stuff for the reason to show off and not for the better quality and taste – after all Thai people have a etiquette for drinking whiskey and that’s mixing it with soda and ice. The common types of whiskey you can find in the night clubs are Red Label, Black Label as well as Blend. Interesting note here: You see a lot of people buying their bottle at the 7 Eleven and bringing it straight inside the club which the management usually has no issues about. A red label usually goes for about 2,000 Baht in the night clubs while you can get a Blend for 800 to 1,000 Baht and that price often includes the first bucket of ice as well as a couple of mixers. I loved Blend 285 for its special attractive price and a common test which knoks down the same and that great satisfaction every time. Wow!!!! The Thai stuff is just YUK! Don’t drink the home brew (moonshine) either. I just buy Chivas or Black Label and enjoy as it is cheaper than at home. I buy the Thai stuff for Thais when entertaining as they seem to like it. I always get them to drink it straight without the water chaser and watch them get hammered in a few minutes… pretty funny. Although it’s not so good, there is nothing better than knocking down a cheap bottle of Hong Thong or Sang Som and some Redbulls at the corner 7-11 with your buddies before you hop into a taxi to RCA.